by Betsy: Boxed in straight lines. I'm continuing with my box theme from last post. This time, a box for my Zentangle® tiles. I thought I'd combine the box with this week's Diva Challenge #219 straight lines. I decided ING was a nice tangle with all straight lines. But what to embellish with? Hey wait, look at all those nice triangles, those are just perfect for Maryhill! I call it MaryhillING. 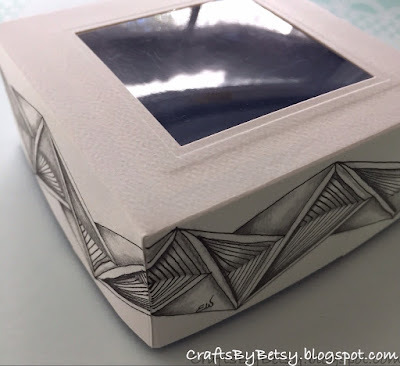 Last post I made a slider box with my Ultimate tool from Crafters Companion. Although this tool is great for boxes, I thought I'd try today's box without it so you can see you dont have to have it. A scoring board is nice (I used my Scor-it) but you can just score with a stylus or folding bone and ruler. Cut two pieces of cardstock 6.75 inches square. I cut one from a heavy pearlescent cardstock scrap. The second from a lighter weight watercolor paper (in hindsight a heavier weight might have been nicer). Starting with the lid, I scored at 1.5 inches in on all 4 sides. Next I die cut my square by centering it. No measuring, it's easy to center once the score lines are there. You don't have to have a square die. Any shape that is smaller than your center square should work. For that matter you don't have to die cut it, you could measure and cut out a square with a craft knife. Or you don't have to have an opening at all, just a solid box. If you do elect to cut an opening in your box lid, cut a piece of acetate a little larger and carefully glue it to the inside. I have a selection of acetate from used packaging to select from. I then cut a frame to cover up the glue on the inside. Pretty easy to do with nesting dies. After die cutting my lid, the score lines were flattened out, so I re-scored them. 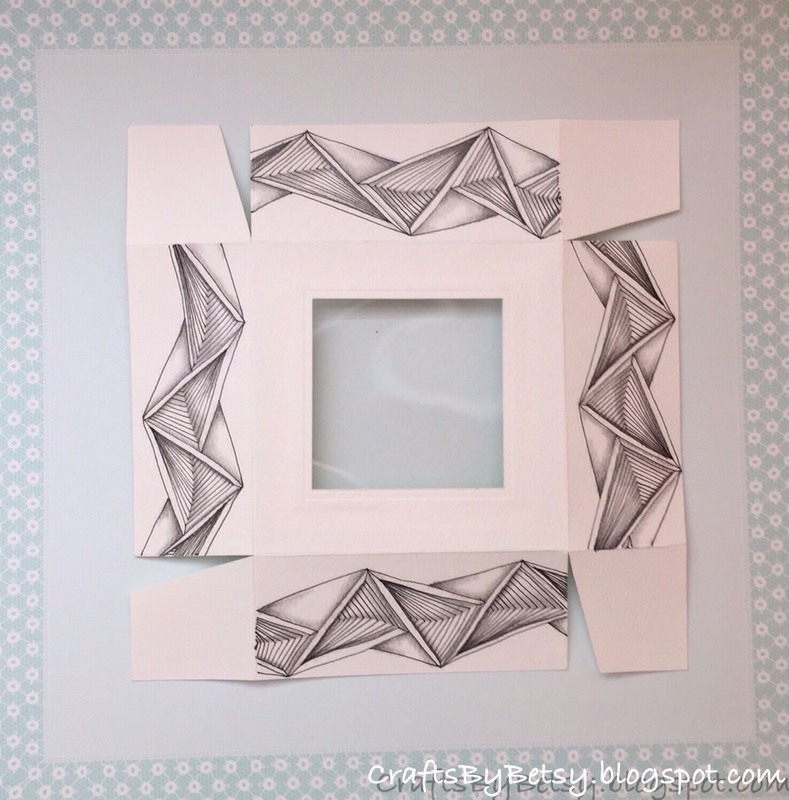 Next I cut out the small triangles as shown in the picture above. Just cut on the score line up to where it intersects and then (from the small square side) cut up to meet at the intersection. Do this four times. Now comes the fun ... tangling! I suggest drawing, shading and spraying with a fixative before assembling. You can use a post-it or a scrap of paper to cover the acetate while spraying the fixative. For the base, remember you are starting with the same size square, or in this case, 6.75 inches. Score at 1 9/16 (so just 1/16 larger than the score marks on the lid) on all four sides. This gives you a slightly higher side and a slightly narrower base so it will easily fit inside the lid. Fold and cut out the notches just like the lid. Glue (I suggest a wet glue, like school glue.) Ta-da a custom box for your tiles! Of course you can adjust the size to make any size box you want. Can you guess what size I'm gonna do next? I enjoyed the straight line challenge, but since I just used two tangles, I thought I'd try more. I'm always impressed with Lily Moon's Zentangle pieces. She does such a nice job with contrast and sometimes adds black to the point where I'm wondering if it's a black tile or a white tile. I might have gotten carried away with the black, but, in any event, thanks for the inspiration Lily! Tangles are Hollibaugh, Hibred, Knase, Cadent (with Cubine center), Rick's Paradox, Tripoli, and Hurry. Amazing box, so nicely done. That box is something special. I'm seriously impressed with your ideas! 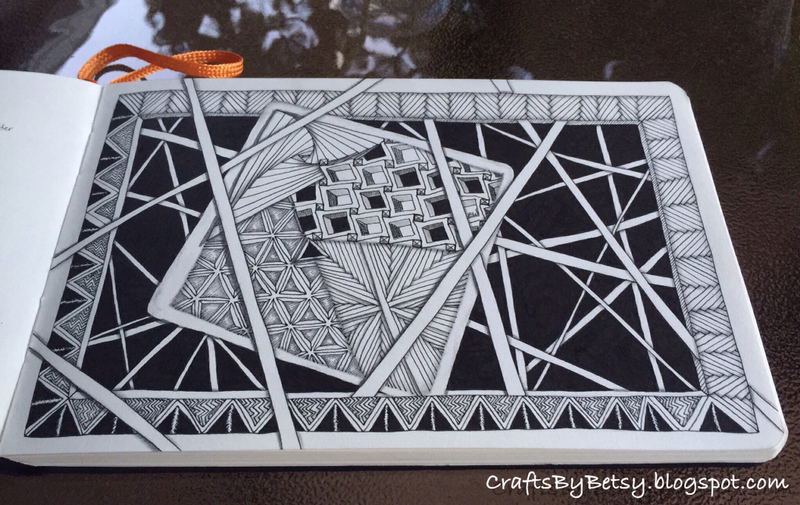 And the tangle in your journal is really something else--it really pops with the balance of black and white! I love the journal entry Betsy! Is that a Moleskine I see? The box is a great idea to keep the tiles together - what a lovely tangle you have done around the edge! The journal is a special one. It's from my class at CZT 14. My name in calligraphy by Maria on the front.... So nice! It is a "Hand.book" by Global Art Materials measuring about 8.25 by 5.25 inches with cream colored pages. Thanks! Love your Box Turtorial, Betsy. So much fun, and a very wonderful project. Your tangelation of the box is awesome. (I love the Tile you have pictured inside the Box.) Your Diva Challenge is beautiful. Terrific design and so beautifully drawn. Your black is delicious and really showcases your patterns. Beautiful work. I love the boxes...being your friend is starting to cost me lots of money (I want your toys!) You do such awesome work. i think thats called a business expense for you now! But try a box with the ruler and bone folder. They're pretty easy! Love your box, and the ING on it! Great journal page too - I love the look of the tile tucked into Hollibaugh. Wonderful box with fantastic ING! Absolutely gorgeous your journal page ... very creative!